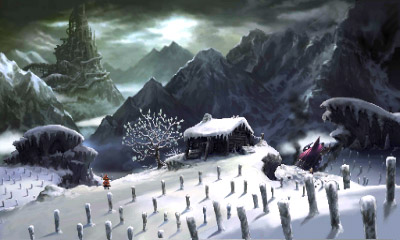 When Square Enix released Bravely Default in 2013, people lauded it as a glorious throwback to the classic Square Enix of old, where rich turn-based combat, a job system straight out of Final Fantasy V, and old-school random encounters met with an ultra-traditional tale of four heroes of light, crystals, and saving the world. Related reading: Matt's review of Bravely Default on the Nintendo 3DS. Perhaps even against Square Enix’s expectations, that adherence to tradition was rewarded by the faithful, and Bravely Default was a bone fide hit, granting the publisher a new franchise on a golden platter. Never one to miss an opportunity, Square Enix is back with Bravely Second: End Layer, and, impressively, the company has resisted any temptation to “innovate” with this one. If you’ve played Bravely Default then you know exactly what you’re going to get here, and that is, as far as I’m concerned, a very good thing indeed. Bravely Second kicks off with an introduction that will spoil every major plot hook in Bravely Default, so if you haven’t completed that game yet, and do care about spoilers, you’d be best off finishing it off first. But Second needed to do that, because as the title suggests it is a direct sequel to the first game and you do need a working knowledge of Default’s plot to understand what is going on. It’s even better if you don’t need the introduction at all – returning characters have much greater punch in Second if you already know who they are from spending dozens of hours with them the last time around, and given that your own party contains returning characters, it helps if you already know who Tiz is and why Edea is one of Square Enix’s most awesome female characters ever. The new heroes are great fun, too. Yew, who is the main protagonist this time around, is a nervous little fellow, and that’s played to maximum comedic effect, but here’s there for his friends when it gets to the crunch. Magnolia is a girl from the moon on a quest for revenge, and instantly became another favourite. Voiced by Amanda Winn Lee, the same actor who brought Yukiko to life in Persona 4, Magnolia has this flirtatious quirk and the way she throws French turns of phrase into her statements makes her really stand out as a distinctive, original character. That in turn helps boost the comedic value of Bravely Second. As with the original, humour is a very important device that the writers have used to develop the relationships between the characters and help us connect with them. The self-deprecating, dry delivery of this humour is new, however. The first game was at times outrageously funny, but in a very overt sense of the word. Ringabel, for example, styled himself as a ladies man so of course he was going to be all kinds of excited when Edea wore a revealing bikini as a costume to infiltrate an enemy organisation. In that game the sense of humour was grounded in genre tropes, and as funny as it was, it was very much rooted in the JRPG tradition. Bravely Second’s humour, meanwhile, is droll, like it was written by the Monty Python team itself. 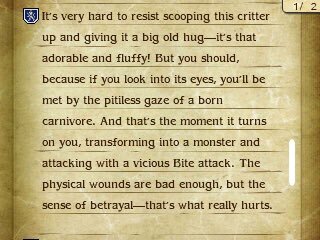 Yew writes descriptions of the enemies he encounters in his journal, and the way he describes some of them had me in tears (see below screenshot for an example). When Tiz first joins the party, the first thing he does is pull a Jedi mind trick on some enemy guards, delivered completely deadpan, that allows the party to sneak past without a fight. While the overarching narrative is another example of an epic quest to save the world (and a princess rescue thrown in for good measure, though as you can probably guess it’s not the traditional damsel in distress trope you might expect), the game’s sense of humour really enlivens it and makes the moment-to-moment storytelling fresh and original. There's even some severe fourth wall-breaking antics that take things to a degree that would make Antonin Artaud proud. This game knows how to be right out there, and it's the more charming for it. My only criticism of Bravely Second’s narrative is a sharp and poorly handled example of ludonarrative dissonance. Two of the party saved the entire universe in Bravely Default. That they’re back to being underlevelled and barely able to hold their own against grunt soldiers is something the game does not even try to explain, and while you could believe that Tiz would be again weak, having spent two years in an effective coma in the lead up to Bravely Second’s events, Edea’s got no such excuse. She should be ripping through the enemies all the way to the endgame, mrgrgrgring all the way (for people that haven't played a Bravely title before the mrgrgr is the most adorable growl ever written into a JRPG, and is Edea's trademark phrase). It’s understandable from a mechanical point of view why the development team reset the heroes statistics for the new adventure, but with a narrative that has so much attention to detail put into it, having heroes of multiple worlds starting out barely past level one is a disappointing oversight. Complementing the narrative is a combat system that, as noted before, has not really changed from its predecessor at all, and that’s a good thing. 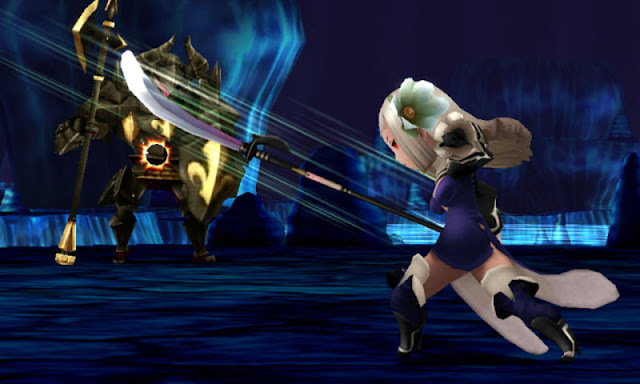 Bravely Second offers a traditional turn-based combat system, that we’ve seen in so many JRPGs before, and mixes it up somewhat with the “bravely” mechanic. Rather than take just one action in a turn, it’s possible for characters to take 2, 3, or even 4, by expending “BPs” to give themselves additional actions. Some really powerful attacks even require the expenditure of BP to execute them at all. A character can save up BP by going into a defensive blocking mode – they won’t take much damage from an enemy attack and will earn one BP in a turn, but they won’t be able to take any other actions either. Alternatively, it’s possible to go all-out and go into negative BP. The risk of doing that is that the character will no longer be able to do anything until their BP count resets to zero, and when in negative BP, it’s not possible to defend at all. In other words, that character will be a sitting duck for a while. This risk-reward mechanic becomes really strategic in boss fights, and generally requires that players balance out what each of the four characters are doing, so that while some go on rampages into negative BP, others play more conservatively so they can provide assistance to their allies when the counter attacks come. Bravely Second’s jobs system helps build out the game’s strategic layers further, and is one of the most nuanced and enjoyable job systems you’ll ever come across. After beating key bosses, you’ll acquire their job, which you can then assign to one of your heroes, and in doing so they’ll pick up the key attributes of the enemy they just beat. Some jobs focus on dealing damage, others focus on magic use, and still others play support roles. It’s important to build out a balanced party that has a good mix of skills, but there are dozens of jobs available, and only four heroes, so on any given play through you're not going to be able to play with all the jobs. Further, swapping jobs too frequently isn’t a good idea, as each character has job levels, too, with the more valuable skills that a job offers locked away until they’ve spent quite a lot of time with the job. So it’s important to be able to form a core strategy in balancing the heroes out, and then stick to it until the group can gel as a powerful fighting unit. It’s also worth noting that discovering each new job was a delight because they also meant new costumes for the characters, and each character looked different in each job costume. 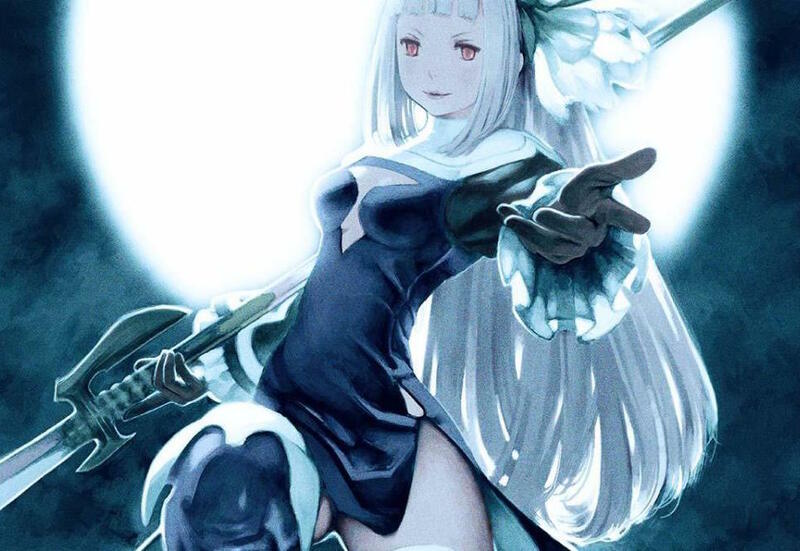 While it’s possible to equip armour and accessories to characters, as you would in a traditional JRPG, in Bravely Second that doesn’t have any impact on the visual look of the characters, and that is ultimately a good thing, as the character design work in making each of the costumes look distinctive on each of the characters deserves not to be wasted by then hiding them under heavy armour or similar. The designs are so distinctive that you’re likely to find the you assign roles to characters based how a specific costume looks on them. I gave Yew the more conservative costumes because, well, that freed me up to put Edea in more… daring… clothing. Though nothing’s too fan servicey or sexualised in Bravely Second (obviously, just look at the game’s approach to art), there’s enough there to play games with the imagination. Because of all this, while it’s possible to make Bravely Second a very easy experience (by turning down both difficulty and encounter rate), my personal recommendation is that you play it on the hard setting, and perhaps even ramp up the encounter rate. 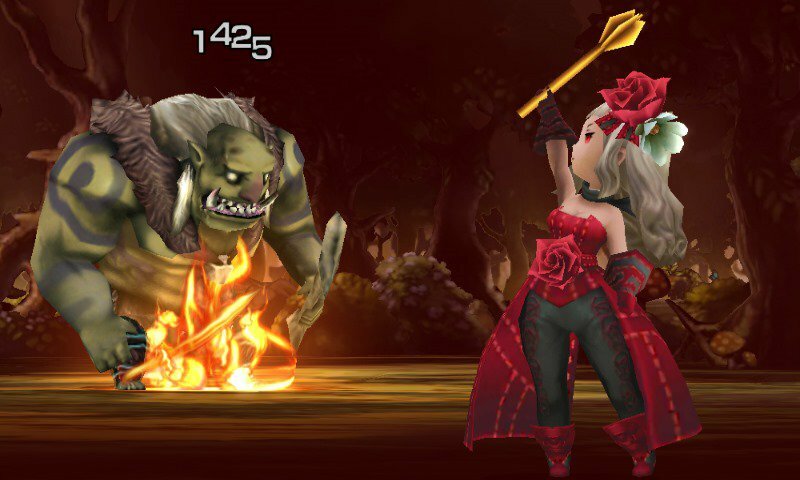 This combat system is at its best when it requires you to be tactical about it, and though the regualar enemies are perhaps a touch too easy, allowing you to spam your way through them even on the harder difficulty setting, the boss battles are truly intense, envigorating, traditional Final Fantasy experiences. 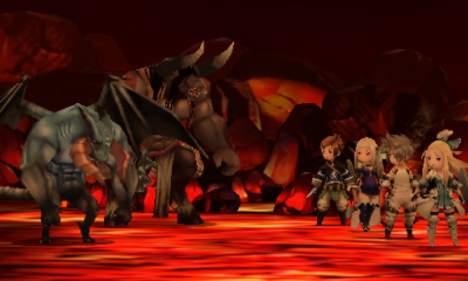 One new addition to the new combat system that helps alleviate the grinding that could become an issue in Bravely Default is the ability to continue battles with common enemies once won. If you defeat a band of enemies in the first turn, you have the option to immediately battle another group. Defeat them and the rewards from the battle increase exponentially, but there is some risk involved there, too – any BP you spend remains spent at the start of the second battle. A couple of times I caught myself being overconfident in starting a second battle with half my party spent down to -3 BP, only to get walloped while waiting for them to recover. Beyond the job costumes, Bravely Second is a beautiful, breathtaking game that really pushes everything possible out of the Nintendo 3DS. From soaring architecture and intricate city designs to an overworld that is vintage Square Enix, Bravely Second has been built with a real eye for detail and a love for tradition. You’ll not actually experience anything in this game that you haven’t seen somewhere before, but the way it is constructed and the consistently high quality as the world transitions from one region to the next is the surest sign that this was an important project to Square Enix. Throw in some really imaginative enemy designs and such genuinely charming character models and you’ve got a game that is right up there with the most aesthetically pleasing on the 3DS. Oh, and I’d be remiss if I didn’t mention that the soundtrack was written by Ryo, whose name might be familiar for fans of Hatsune Miku; Ryo’s the one that wrote World Is Mine. The layered music of Bravely Second demands that it is played with good headphones, with some subtle reworkings of classic Final Fantasy themes thrown in among some eye-opening original works and then some genuinely silly stuff to go with the game’s more comedic moments. It’s a masterful composition, even above what Bravely Default achieved, and the stellar voice cast is the icing on the cake. Related reading: On PlayStation 4, Final Fantasy Type-0 is also a glorious throwback JRPG from Square Enix. Bravely Second: End Layer is an absolute delight of a game. Traditional where it needs to be, and wildly humorous when it wants to, this is the perfect follow up to the spectacularly successful original title. It’s subtly better, with more refined and better balanced mechanics, and now has some existing lore and characters to draw on, that help to give its narrative more depth. By the same token, Square Enix hasn’t tried to bring innovation where it wouldn’t be welcome, and so Bravely Second is also a triumph of game design restraint. If you like my work, please consider backing me on Patreon. The more backers, the more work I'm able to do for you!